Apologies for the dodgy food styling, it was past lunch and I was starving. 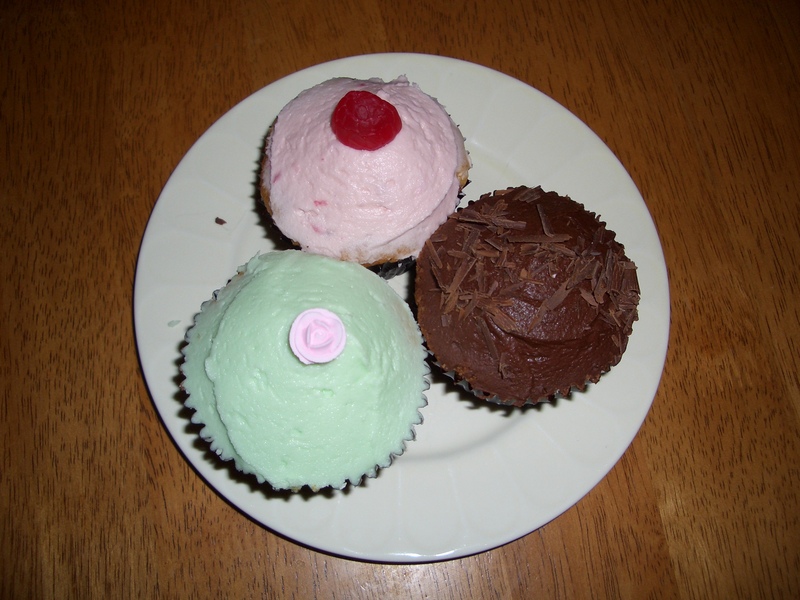 Pictured here from the top, clockwise, are a vanilla raspberry, chocolate and vanilla. Vanilla seemed popular today because I snapped up the last one. The bake shop is intimate and quaint (ie not too many tables) with a selection of savoury flans and sandwiches in addition to the sweet delights. And boy, do they have a lot…salted caramel chocolate slice (is salted caramel the new black of sweets? ), scones, all sorts of cakes by the slice, all beautifully presented. I also tried the passionfruit pound cake (sorry I sliced it up before taking this!) which was moist and tangy. Open for two months, Sherbet seems unlikely to remain a suburban secret, given anyone with a sweet tooth who read the STM article last weekend will have added it to the must go list. Having travelled far and wide in search of cupcakes (Kalamunda, Sydney, Los Angeles) – I must say, these were pretty darn good – moist cake and simple, delicious but not overdone frosting. And yes…they all tasted good and NO I did not actually eat all three, I shared. A bit. Click here to visit Sherbet’s website.